I was there - I was an English student studying French at Strasbourg University. Five of us, including my future wife, squeezed into a VW Beetle for the journey. It was a brilliant concert as Yes have the right sort of big sound for a big hall, and Donovan was fun as well. I've been there. This is the only show I saw of the best prog rock band from Earth. But Yes music is still there! I'm French and i doesn't speak so good english! I Kwow a Person who was at this show and i see that an unofficial record have been made.I wanted to know if it's possible to have it and how to have it. Thank You For your Answer and Rock'n Roll Forever! I'll confess right now to having seen no GFTO show, much less in France, but your mention of several photos from this concert caught my attention. Can you scan and post them here? I'd love to see them. Good to know your experience was a great one. I didn't see Yes for the first time until 1978, but we're both very fortunate to have seen them in their prime. I have almost the ticket that I bought for less then 6 Euros. It was the good time with the prices. In my own collection, I have 15 pictures that a friend took at this fantastic concert. The playing list is exact. 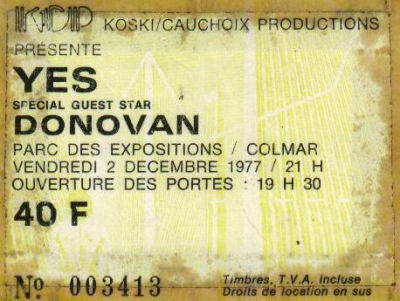 The 2nd of December 1977 Yes was in COLMAR - Parc des expositions (France) close to the Germany border. I still have the ticket as a proof and Donovan was effectively Guest Star. As far as I could remember the set list is right. The tour song was "Here in Colmar"!